Drill a new dedicated research borehole with the aim of recovering a core from the boundaries of solid and molten rock, and monitoring temperature from that point onward. In the meantime, we will collaborate to develop new temperature-resilient technologies to monitor pressure. The borehole will be cased using new innovative, patented, flexible couplings allowing the steel to thermally-expand without accumulating too much stress and strain on the casing. 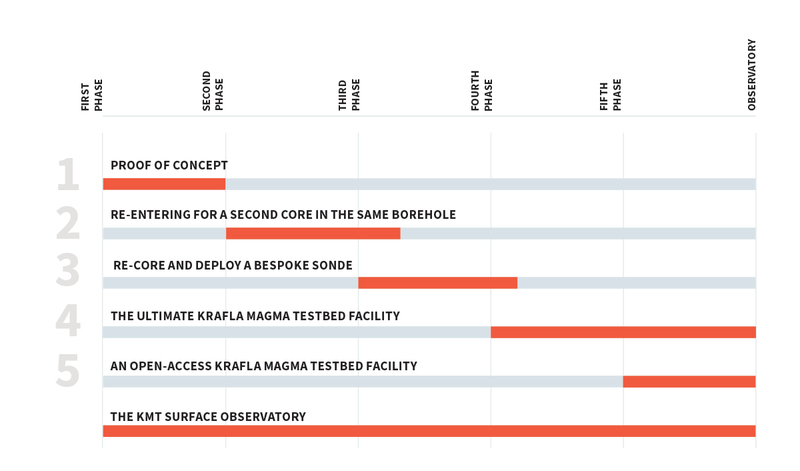 Following successful recovery of a core, the borehole will be allowed to heat up, under constant monitoring and supervision, in order to monitor magma in situ. Following a successful proof of concept, the team intends to re-enter the first hole with a drill rig to recover another core (for second point in time series) and monitor temperature as well as pressure while the borehole heats up again. When the conditions at the bottom of the well have reached equilibrium with the surrounding environment, we may initiate flow testing of the well (involving cooling of the magma). If we deem the well and the conditions suitable without jeopardising its future, a flow test will put the new flexible couplings and casing to the extreme test of surviving the harsh condition of high temperature and corrosive geothermal fluids. The flow-test will also provide valuable opportunity to sample the chemistry of the geothermal fluid close to magma as well as various opportunities for geothermal engineering testing and experiments. In the 3rd phase, we will re-core magma from the first well and deploy a bespoke sonde to measure viscosity and density of the magma in situ. The sonde will be designed so it can sense the solid base of the magmatic body, thus defining the thickness of magma underlying the geothermal system. In the 4th phase the intention is to drill a second research hole and recover a core in a different part of the magma reservoir, while monitoring P-T in the first hole to test the response of the magmatic system to geothermal drilling activity. This data and associated stimulation of magma in two places will enhance our ability to image the spatial distribution of the magma reservoir. Following completion of the first delivery phases, the KMT research facility will opened to permit cutting-edge science by the research community. The facility will be open to the wider community through yearly calls for proposals, which will be considered by the KMT Executive Board. At the sametime the KMT will be host to numerous surface and shallow surface measurements (direct and monitored). The project board will work with the local community to develop engagement opportunities around the observatory.